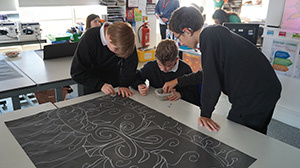 Year 9 students were treated to the wonders of Asian culture on this year’s Asia Day. There were a range of activities on offer including a Japanese manga workshop, Asian food tasting and a chance for students to strut their stuff in the dance studio Asian-style! There were also beautiful rangoli patterns created and outside speakers from the Red Cross. A particular favourite was a talk from Yan Gao, a Chinese national who taught our students some Mandarin phrases and writing. A brilliant day was had by all.